Torrential rains have caused unprecedented flooding in central Texas, killing at least two people and prompting a state of emergency near Lake Travis, northwest of Austin. Officials have started opening dams to relieve Lake Travis, with even more rain forecast through Saturday. One woman was found dead in Llano but her name was not released. Another body was found on the banks of Lake LBJ. Gov. 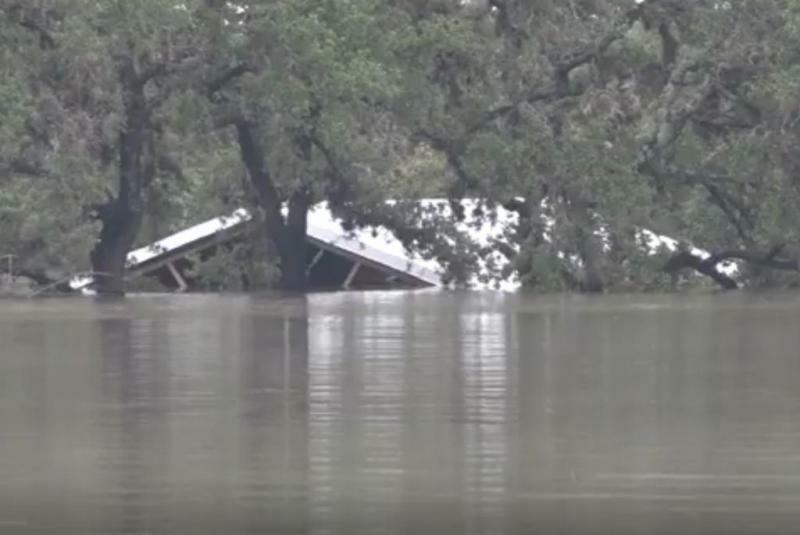 Greg Abbott issued disaster declarations for 18 counties affected by the flooding. "This is a historic flood," Lower Colorado River Authority General Manager Phil Wilson said. "All of the Highland Lakes are closed and remain closed until further notice. ... We have flood operations underway at every dam along the Highland Lakes. This continues to be a very serious situation. ... People need to take every precaution to protect their safety." Lake Travis topped 703 feet above sea level Thursday, the fifth-largest height on record. The lake is expected to rise another 2 to 7 feet. If it does, a record 8 flood gates could be opened on the Mansfield dam, 13 miles from downtown Austin. The hydroelectric dam has had four floodgates open since Tuesday. Llano County emergency management coordinator Ron Anderson warned people not to return to their homes yet. "We really are not sure if this disaster has fully unfolded," Anderson said. "We could see another rise of the Llano River. Homes that have been evacuated are going to have to be evaluated before we can say they are safe to enter. We are asking people to be patient with us." Shelters remain open in the area. The RM 2900 bridge collapsed and washed down the river. Officials warned drivers to stay away from the area where the bridge washed away.